Megaupload’s request to dismiss the criminal proceedings against it on the grounds that the U.S. Government failed to serve the company, has been denied. District Court Judge Liam O'Grady believes that the authorities could still satisfy the federal rule if they can prove that Megaupload is an alter ego of Kim Dotcom. At the same time, however, the court leaves the door open for Megaupload's legal team to file for a motion to dismiss the indictment until the government finds a way to issue the summons. Three months ago Megaupload asked the court to dismiss its case because U.S. law doesn’t permit criminal proceedings against foreign companies. According to “Rule 4” of criminal procedure the authorities have to serve a company at an address in the United States. However, since Megaupload is a Hong Kong company, this was and is impossible. Only by dismissing the case can the court protect Megaupload’s due process rights, the defense argued. These rights are clearly at stake according to the lawyers, who noted that Megaupload has been deprived of its property, had its reputation tarnished, and its business destroyed by the Government’s actions. However, the Government disagreed and asked the court to deny Megaupload’s motion. Among other things the Government claimed that the federal rules shouldn’t be interpreted so narrowly. A company should only be served on a U.S. address if they have one, they argued. In an order that was made public today, Judge O’Grady sided with the U.S. Government and denied Megaupload’s motion to dismiss the case for a lack of jurisdiction. “It is doubtful that Congress would stamp with approval a procedural rule permitting a foreign corporate defendant to intentionally violate the laws of this country, yet evade jurisdiction of the United States by purposefully failing to establish an address here,” he writes. In the legal analysis, Judge O’Grady adds that even if Rule 4 should be interpreted narrowly, there are still options for the Government to serve Megaupload. He notes that this could be done under the “alter ego” argument, where Kim Dotcom or any other defendant is held personally responsible for Megaupload. “In this case the government may be able to prove that at least one of the individually named defendants is an alter ego of the corporate parent. If so, the corporation’s last known address within this district will be the address of the individual defendant, once extradited,” O’Grady writes. While the motion to dismiss the case for a lack of jurisdiction was denied, the judge does leave an option open to dismiss the case temporarily until Megaupload is properly served. “The Court leaves open the possibility for future motions and briefings as to whether the Defendant has been deprived of due process by this delay and whether the indictment should be dismissed until Megaupload could be served,” the order reads. 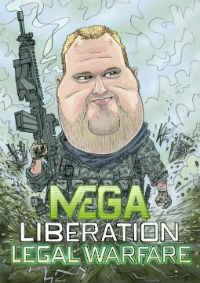 TorrentFreak has asked Megaupload’s legal team for a comment on the order, but we have yet to hear back from them. It seems likely though, that Megaupload will take up the court’s suggestion and file a motion for a temporary dismissal, which interestingly enough is something they asked for in a previous hearing. Kim Dotcom has also pointed out this apparent irregularity, which suggests Judge O’Grady may have made a mistake here. It’s certainly not the last we’ve heard of this. The U.S. Government, meanwhile, will celebrate the order as one of their first victories in this case. c There are 111 comments. Add yours?